Here in California, the late winter wind and rain may result in a less than stellar production of fruit from peaches, nectarines, plums, pluots, apriums, apricots and other deciduous fruit trees that attempted to set their blossoms during the ferocious storms of March. And peach trees were especially hard hit with peach leaf curl, which may curtail the amount of fruit on the peach and nectarine trees. 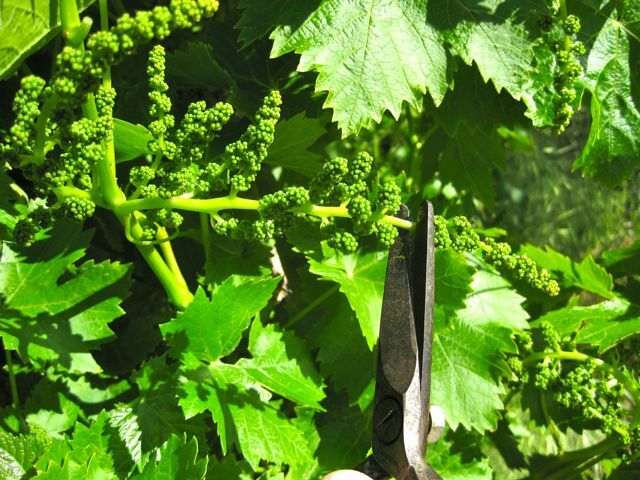 For table grapes: Thin out the bunches so that there is at least six inches of space between each remaining bunch of table grapes. 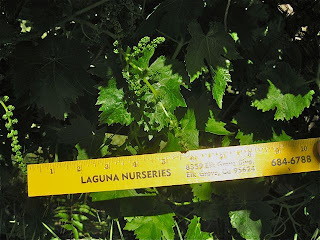 "As a rule of thumb, your vine should have not more than eight clusters per cane or 25-30 flower clusters per vine for Thompson Table grapes," explains UC's Pam Geisel. Cut off the "tails" from the remaining bunches at that same time. 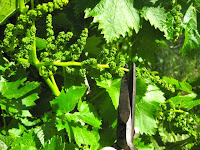 This is the lower one-quarter to one third of the bunch, where it begins to taper down in size.This will send more energy to the remaining grapes on the bunch. The book, "The California Master Gardener Handbook" advises that fertilizer can be applied for each grapevine when the berries are about a quarter-inch big, usually in May. The same book advises gardeners to apply about 50 gallons of water per week per vine, during the hottest months (June through August) here in the Central Valley of California. Apply less (about 35 gallons a week) during May and September. For apples, European and Asian pears, apricots, peaches, plums, kiwifruits, persimmons and pluots (pictured to the left, unthinned, and then thinned): space fruit evenly along each branch, with perhaps four to six inches between each piece of fruit. More importantly, be sure to leave the largest sized fruits on the tree or vine. 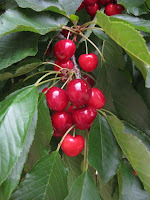 The best time to fertilize these crops is in August, when the trees are setting their fruit buds for the following year. The UC home orchard specialists recommend applying either seven pounds of a 16-16-16 fertilizer or 70 pounds of steer manure per tree. 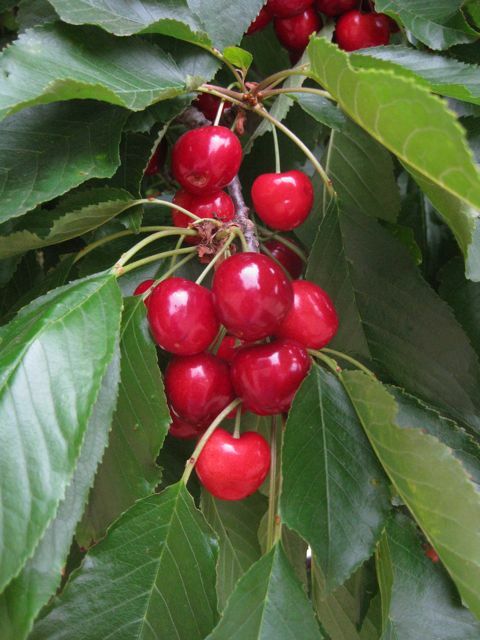 Because of their small size, cherries are not usually thinned from backyard trees. Also, nut crops, such as almonds and walnuts, are not thinned. And this valuable tip from the experts at Louisiana State University: when thinning fruit, keep looking at the tree; don't look at the ground. Seeing all that fallen fruit may dissuade you from the task at hand.